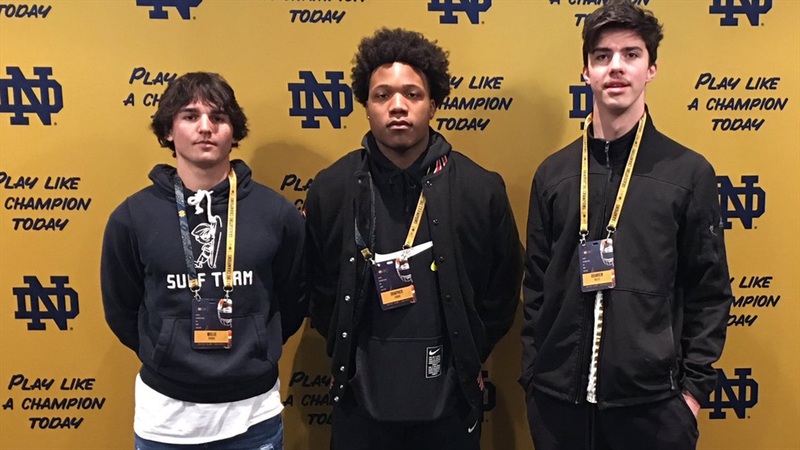 Drapher Cribbs‍ made a trip out to Notre Dame last month and the 2021 Michigan running back returned this weekend and he brought some friends this time. Cribbs was joined by East Kentwood High School teammates, 2021 quarterback Branden Miller‍ and 2021 defensive back Willie Berris‍. East Kentwood strength coach Marty Martens brought the kids down. For Cribbs, it was a chance to see more than what he saw back in February. He spoke with Irish assistant Brian Polian. “He said it was nice to have me up there again and he wants me to come back,” Cribbs said of Polian. The 6-foot-2, 210-pound Cribbs is receiving interest from multiple Power-Five programs, including Michigan, Michigan State, Ohio State and Iowa among others. He expects to return to South Bend for camp this summer. For Miller, a 6-foot-4, 205-pound signal-caller, this was his first trip to South Bend. “I liked it a bunch actually,” Miller said. “The facilities were really nice. It was very traditional. The tradition at Notre Dame is unlike anything I’ve ever seen. Like Cribbs, Miller was talented enough to play varsity last season, but was behind a three-year starter. The staff at East Kentwood is confident he’ll emerge as one of the top quarterbacks in his class when his time comes. He also expects to return for camp. “Probably spending more time with my position coach and maybe seeing more of the academic facilities,” he said of what else he’d like to see when he gets back. Berris transferred to East Kentwood this offseason from Colonial Forge High School in Virginia. The coaches at East Kentwood are excited about his potential at defensive back and slot receiver. His father, Ret. Col. Willie Berris, Sr., played at Western Michigan and was a captain in 1988. He had the chance to speak with Irish defensive backs coach Todd Lyght. He too, plans on returning for camp. “When I get back, I’ll probably want to see them in the film room, how the coaches interact with them in the film room and how he coaches them in the film room,” said Berris.